They found her car. That was the good news. She was only in the store for a short time and when she came out, her car was gone. Long gone. But the police said that was the good news, which meant a qualifier was coming. The police waited for effect. Let the silence deliver the punch line she knew was coming. The bad news came after the dramatic pause, letting the image of a chopped vehicle sink in. Her car was missing some parts. She didn’t have to be a certified auto mechanic to appreciate what these missing parts meant to her car. It meant her car was still going to put down, sold for whatever parts were left. Her car was missing the engine, radiator, tires, muffler, seats, and a whole bunch of other parts. If she wanted the rest of the car, she’d have to look in about three dozen different places spread out over hundreds, if not thousands of miles. Man-made chop shops do their thing fast, especially the chop shops in Flint, Michigan. Mother Nature’s chop shops are more devastating, in the short run. The tornado in Joplin, Missouri wiped out a third of the city in a matter of minutes (helpjoplin.com is a site for disaster relief). 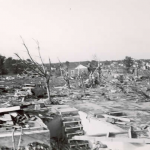 The death toll has put Joplin on the list for worst hit for tornadoes, surpassing the tornado that hit Flint in 1953. Debris from Joplin has spread almost as far as stolen car parts dismantled in chop shops. While the people of Joplin bury their dead, mourn their losses, and try to figure out how to rebuild their lives, the people of Flint hear again that their city ranks the most violent in the country. Flint is the only city on both lists, the worst in human nature destruction (FBI lists), and the worst in mother nature destruction with the 1953 tornado. Flint recovered from the 1953 killer wind. It’s the man-made killer wind that won’t go away. Seth Godin, in his book Linchpin, writes “the easier it is to quantify, the less it’s worth.” The destruction from human nature seems so much easier to quantify, such as those lists churned out by the FBI. Why are the man-made disasters harder to come back from than the natural disasters? Flint and Detroit have become the perennials on the FBI lists, the Duke and North Carolina college basketball version of crime ridden cities. Hurricanes, earthquakes, floods, fires, and tornadoes can utterly destroy huge swaths and in a few years there are signs of a comeback. Mother Nature does her thing, and then steps back to watch what the human race is made of. But when the worst of human nature does its thing, over and over, you start to feel Jesus will come back before Detroit and Flint. The ambitions of urban planners are tossed aside like empty beer cans. The folly of human nature is too much, making plans for renewal seem as if thought up by a Graham Greene character in his novel on the Vietnam War, The Quiet American. The quagmire of domestic Vietnam’s go on forever, while the killer winds subside and bring sunny blue skies. The worst in human nature is passed from generation to generation, explaining why the perennials stay at the top of the FBI crime lists year after year. Everyone who has lived or worked in these hard hit areas has their share of war stories. The quagmires, or social Chernobyl’s, are not just in the urban areas. Small towns a long way from the bigger cities suffer from the same malaise, and share the same stories. They share the same smell of defeat, like the smell of napalm in Vietnam. I watched in disbelief a father thrown out of a store for shoplifting trying to coach his son to do the shoplifting for him. The father was acting like a first base coach, standing under a tree outside the store, giving his son tips on how to steal second. He was caught, thrown out faster than his father. A lot of these store owners have a rifle arm. The real thing. A rifle at the end of their arm. Another time a woman in front of me was caught shoplifting a frozen turkey she tried to hide in her shirt. Her kids were waiting for their Thanksgiving dinner. They might still be waiting, depending on her prior offenses. I suspect this wasn’t her first go at breaking the law. Travel enough and behavior like this becomes almost routine, making it even more unnerving. Rich Lowry writes that the most important question in politics is about jobs. So does Michael Moore, Paul Krugman, and many others across the political spectrum. 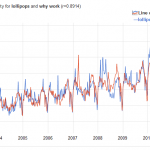 That question could be rephrased to ask where are the lollipops? San Francisco journalist and former Flint native Gordon Young writes about all things Flint with his Flint Expatriates blog. University of Michigan-Flint’s economics professor Mark Perry’s blog, Carpe Diem, is one of the top economic and business blogs. He’s now at the American Enterprise Institute in Washington D.C., making him very capable of answering lollipop work related questions. Randy Turner, a school teacher and former journalist in Joplin has a blog, The Turner Report, with up to date info on what’s happening in Joplin. Whatever the people of Joplin are feeling right now, they can’t afford to lose their lollipop. Here’s an example of how Mother Nature is responding to the damage from human nature. This picture is from the abandoned city of Pripyat. The city had 50,000 residents until the 1986 Chernobyl nuclear catastrophe. 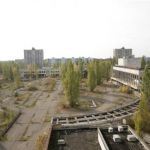 Everyone in Pripyat was forced to evacuate. Nature is slowly repairing the damage. In another famous man-made disaster triggering the wrath of Mother Nature, tin miners dug too close to a sea wall in Malaysia. This amazing video of the 1993 disaster shows the Indian Ocean pouring in, and the massive landslide.